Drawing on his work with hundreds of nonprofit and public organizations, Doug Eadie describes how board-savvy CEOs effectively manage the human dimension of the board-CEO relationship. He goes right to the heart of the issue: CEOs can do a stellar job of managing the technical requirements of their jobs but may ultimately fail because the partnership with their boards unravels over human, interpersonal issues. Therefore, Doug writes, partnership-building must be at the top of the CEO’s list of high-stakes responsibilities. 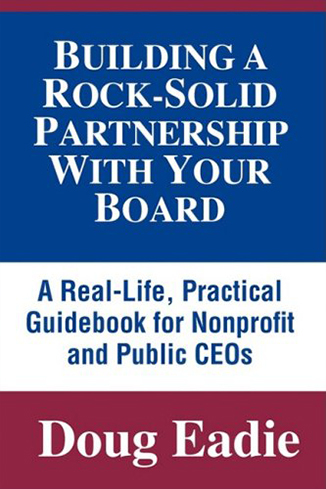 Using real-world case examples, Doug describes five keys to building a rock-solid partnership between the organization’s CEO and the board of directors: 1.) Bring the right mindset to the governing arena; 2.) Make the board chair a close ally; 3.) Turn board members into strong owners; 4.) Make the board’s work more interesting and enjoyable; and 5.) Put a well-designed CEO-evaluation process in place. The perfect companion volume to Doug’s Meeting the Governing Challenge, this book provides tested, practical guidance that you can put to work today in helping to manage the emotional/psychological dimension of the CEO-board relationship.